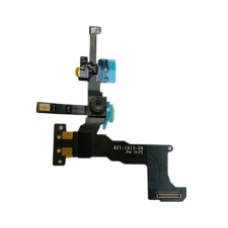 Complete replacement proximity sensor cable assembly, with noise cancellation microphone and front camera, this original iPhone 5s spare part is a prefect replacement if any of the components on your sensor cable assembly have failed. Installation of this part requires no soldering. Typical symptoms of sensor cable failure on the iPhone 5s are, the screen will not automatically turn off when you receive a phone call and place the iPhone to your ear, recorded videos will have poor quality or no sound when played back, or your front Facetime camera no longer functions. * Apple Part Number: 821-1613-08.